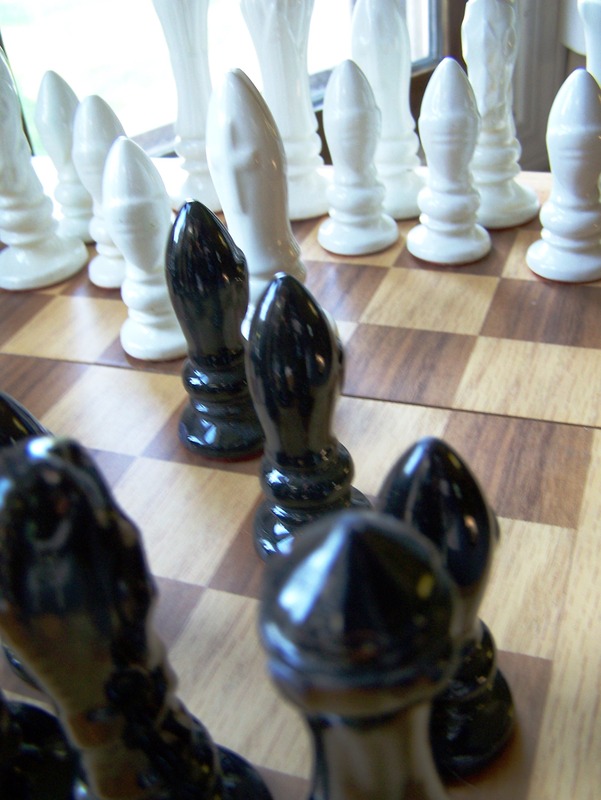 According to the website, CHESSVIBES, the game of chess is very beneficial to the player. And I believe it. I just look at a chess board and I feel smarter. Nearly 35 years ago my Aunt Sue crafted a chess set for me. She made it using ceramics and despite three decades of moves, the porcelain pieces have survived. Oh, sure, the blacks have have a few chips but a quick touch-up with a sharpie makes them good as new. To be honest, I don’t use the pieces as often as I should. I suspect my memory would benefit from an occasional game, not to mention my creativity and problem solving skills. But finding a worthy opponent has been quite a challenge. When my youngest, at the age of 14, started beating me regularly, he lost interest. When my “play-by-mail” friend stopped writing, I put the board away. But as I age, I have come to realize that my mental acuity is flagging. My ability to recall names and dates is beginning to wane. And so, out comes the board. It’s time to polish the pieces and start searching for a new challenger. After all, life is short. We might as well make the most of every moment. Fancy a game?